Lyon Eats: Found: a better brown sugar substitute! Found: a better brown sugar substitute! I am very excited about what I found today! It's the closest thing I have found here to brown sugar. Of course, I have used sucre vergeoise - a commonly recommended substitute. I just find that the taste is lacking. It's missing the molasses flavor. I've also tried raw sugars, but they have this off-taste and not enough molasses flavor either. So today, on a lark I picked up this: "Douceur de Coco" 100% sucre de cocotier non raffiné, s'utilise comme le sucre brun. It's coconut sap sugar. It tastes like an extra dark, dark brown sugar, without the funky! (At least in my opinion.) I've always prefered darker brown sugar anyway. It turns out that not only does it taste good, but it is recommended for diabetics due to a low glycemic index of 35. It's spendy, €6,80 for 500g, but for me it is well worth it. You can find it at La Vie Claire near Grange Blanche, 6 Avenue Rockefeller, 69008 Lyon, France. 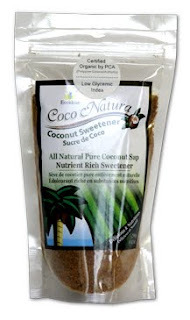 "The taste of pure coconut palm sugar resembles that of brown sugar, yet with more rounded caramel and butterscotch notes, without the metallic ending flavor that brown sugar has." Hey thanks! I was looking for coconut sugar, recommended to me by my doctor who has forbidden refined sugar and ordered me to lose 8 kilos (harsh I know). I tried several shops and even tried to buy it online but the postage costs are ridiculous... then I googled "where can I buy coconut sugar in Lyon" and came to this site. Lucky me, because I live right near the Parc Tete d'Or and will now be coming by the gathering on the 15th! Found: excellent chocolate chip cookies! American desserts - help needed!